Those delightful little creatures with their strange cross-time clothing choices and maniacal grimaces are more than just the player characters in one of the finest social role-playing games going — they're also my friends. 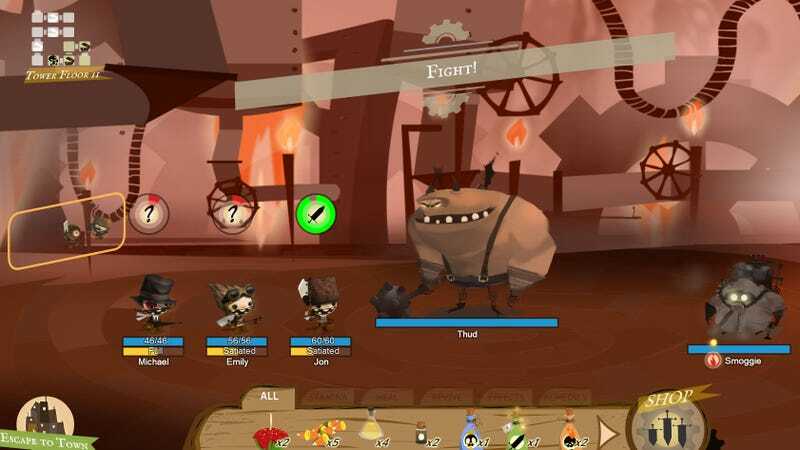 Nexon's The Grinns Tale is a twisted little turn-based role-playing game with a little town-building thrown in for good measure. Players cultivate a team of oddly-adorable warriors, assigning them character classes, forging equipment and harvesting the resources required to keep them powered and geared for the winding climb up a torturous tower filled with bizarre creatures that would do them harm. The Grinns Tale is a social game, fully-launching in November on Facebook and Kongregate (though you can play it now), but it's not the hideously annoying sort of social that more mainstream gamers tend to despise. You won't need to bug your friends for a single thing in The Grinns Tale. You can visit them, should you like, earning decorations and resources for your Grinns by doing so, but you will never their help to complete a quest. You will never need to ask them for 20 pieces of wood. You won't need their help building anything. Well, not directly at least. See, the characters that populate the town you build for your Grinns are Facebook friends, assigned randomly or specifically named. It's the same with the heroes you recruit to your cause. For instance, here's our own Evan Narcisse. In The Grinns Tale, well, mine at least, Evan is an Archer. By building an Archer base in town and upgrading it I can increase his level cap and craft new sets of equipment, so when he goes into the tower to take out the big baddies he's ready for anything. I build lumber yards to generate wood, mines to craft metal. I use those resources to create new buildings and equipment. The only real restriction in The Grinns Tale is time. Though I can speed things up a bit by rallying my villagers, harvesting wood, crafting equipment and upgrading buildings takes time (as well as items gathering in the tower). Even that waiting and downtime is offset by the availability of companion apps on iOS and Android, allowing players to harvest resources, read background information and send gifts to their friends from the relative safety of their mobile devices. But as far as far as exploring the dungeon and engaging in simple-yet-satisfying bouts of strategic auto-attack-style RPG combat, there are no limits. You can go back in again and again. Once you hit the level cap (dictated by village building levels) you can continue harvesting items in the tower until the opportunity for more progression comes alone. The Grinns Tale is really unlike anything I've played on Facebook. The art is wonderfully weird, the music epic and adventurous, and the gameplay is simple and engaging without ever getting frustrating. You should play it.